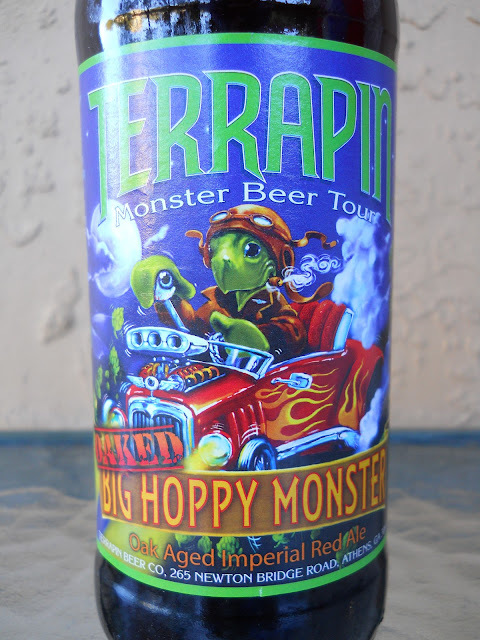 Today I decided to try the 2012 Vintage of Oaked Big Hoppy Monster, an imperial red ale brewed by Terrapin Beer Company in Athens, Georgia. It seems like it was more recent than November, 2009 that I was trying the non-oak aged version. Anyway, I remembered liking that one so thought this was worth a whirl. "Watch Out! This Monster Bites!" 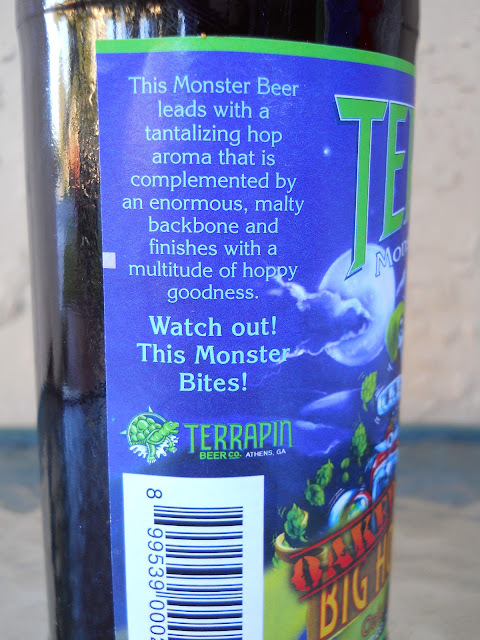 warns the label. I'm not sure how that or the name ties in with the turtle flying the race car in the clouds, but I do lack imagination. Don't miss the stogie that he has in his lips either as the smoke blends with those clouds. Nice aroma. Sugary, malty sweet scent with oak and faint hops. Wow, I was expecting something hoppy, at least flavor-wise. Very sweet flavors. Candied wood chips and sugar-spiked hops. And the 9.1% alcohol makes those stand out even more. Too much wood and vanilla. Sorry, this is not good at all. Syrupy sweet caramel, chewy, with no redeeming balance whatsoever. The finish is dry. Not hoppy in the slightest, just sweet. And alcoholic. And wood/vanilla bomb. That wood is more than just a distraction but that's not the only problem. Where are the spicy hops, the great citrus, the balance, the hoppiness, the bitter bite that made the original a delight? Is this really the same beer with the only exception being barrel aging? Hard to believe, but regardless, tone that part down (a lot)! Save your retail $3 or whatever crazy price they might try to charge you at a bar.